I used to make three trips to the grocery store every week (at least) and plan my dinner for that day in the morning. 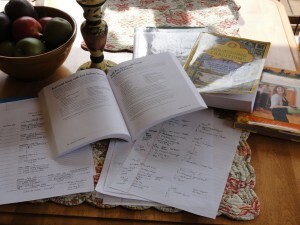 I knew I had to be more disciplined in the area of menu planning than I was, but where was I to start? I am not a tech savvy person, and I love pencil and paper, so I knew whatever I did it was going to have to be simple and not very complicated. I had quite a collection of cookbooks already and had favorite dinners that we loved to eat each week. Flylady was a system that I enjoyed following for cleaning (this is another post in the future), and meal planning was part of her scheduling routine. 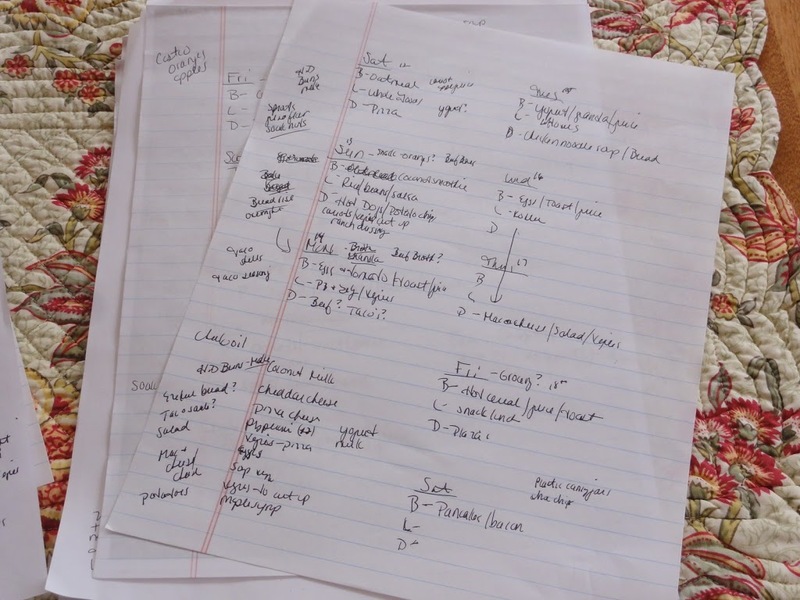 This was my first introduction to truly organized meal planning and grocery shopping. I had bouts with it in the past but no routine that I would ever stick with. I grabbed my calendar, notebook and a collection of cookbooks and started planning. My first round was just dinners, but I decided it would help save time and money to plan out breakfast, lunches, and dinners. I have a favorite weekly meal planning I use and you can grab a free PDF of it here. Everyone has their way of doing things, but one thing I can share is that if you do not meal plan to try it for a month, and you will be hooked. I'm going to lay out my example and would like your comments on how you and your family meal plan. Sunday afternoons are my favorite time to plan as I like to grocery shop on Monday's. I buy a lot of bulk and purchase a quarter of a steer and chickens from a local farm, so my grocery list is usually a lot of fresh produce and dairy items. I shop mainly at three stores: Costco, Sendiks ( our local grocery chain) and The Outpost (a local Co-op). Costco is my bulk store and is a monthly trip that the whole family likes to enjoy. As I sit down to plan, I grab my favorite beverage, calendar, my menu planning sheet, some scrap paper for planning, and a selection of cookbooks that I want to cook from that week. Changing the cookbooks each week gives us some variety. The calendar is essential to check out to see what you have on the agenda for the week. I may need a snack for church. Are we having company? Are we going somewhere for dinner? Is my husband traveling this week? Are we traveling this week? These are all things I check on the calendar before I start. I write down the days of the week on the scrap paper and under each day, break it down into breakfast, lunch, and dinner, make a note of the daily schedule items that affect the menu planning and make a note of these by the corresponding day. I recently made a list of breakfast, lunch and dinner meals to help in the planning and old menu plans are great for ideas too. I enjoy looking through cookbooks to try a new recipe every week for variety, and if it is good, we will add it to the meal list (make sure to write down the cookbook name and page). I keep a large binder with recipes from friends or printed out recipes from online (Pinterest being a favorite site). This is a pretty rough list but it helps in the final meal planning sheet and the grocery shopping list. I plan my grocery list with the rough draft and double check it with my pantry and fridge/freezer before I finalize it. I do rewrite it neatly and organize it by the grocery store aisles. This rough list helps me to visualize what I have to thaw and when what I need to do the day before, can I get things done in the morning that would make dinner easier, and am I going to be out for the day to see if I could switch an easier meal for that day. After the rough list is put together and finalized, it is time to rewrite it onto the meal planning schedule. It seems like a lot of writing but it probably takes me 5 minutes to transfer the list, and it is worth a lot more in time saved during the week. The snack/notes section comes in very handy and don't forget to write cookbook page numbers down for easy reference here too. The final menu sheet is laid out and posted on the fridge, grocery store list is written – total time about an hour – time saved – A LOT! 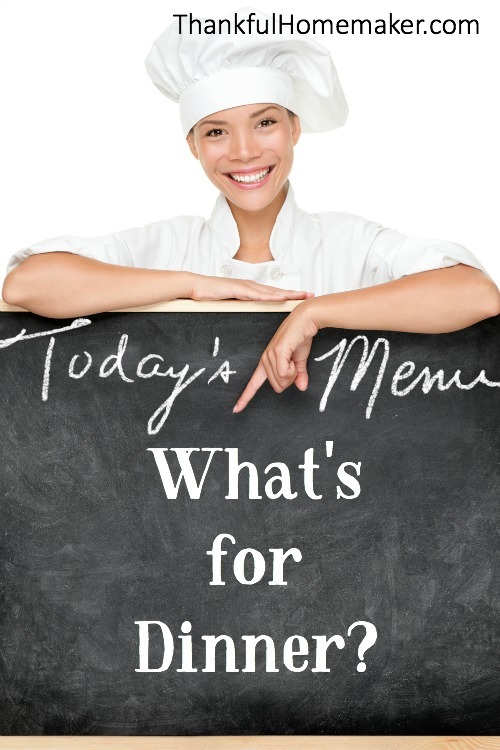 How do you menu plan? Are you a coupon clipper? Do you shop by the sales papers? Do you plan monthly meals? Please share your ideas in the comment section below. I do meal planning but I also clip coupons and when those items are on sale I pick up the things I use. Kind of a bonus. My thing is I have a Daughter in law that lives with me who hardly likes anything. It is hard to figure out what to fix that she likes. Because of health issuees(diabetes) for myself i have to be careful. Any ideas on how to fix that problem? Deanna I don’t have a simple solution but my thoughts would be to sit down with her when you do your meal planning. Get ideas from her on what she likes and how you two can work together in the kitchen so you’re not having to make two meals but ones you can both agree on. I love using Pinterest lately for my meal planning and also to utilize favorite food blogs for new ideas. Blessings to you! Ok, I appreciate this but where is the recipe for the coconut smoothie- my daughter and I would love that! I will try your plan out as I so need help in this area! I would love to share the recipe and I am sorry it took me this long to respond 🙁 It is from Eat Fat Lose Fat by Mary Enig – (with a little tweaking) and here it is. Sometimes Dawn I use a scoop of Vanilla Whey Protein powder if I don’t have good quality farm eggs on hand. Blend all together 🙂 Enjoy! We are four adults in our home now and I double it and it is more than enough for all four of us. 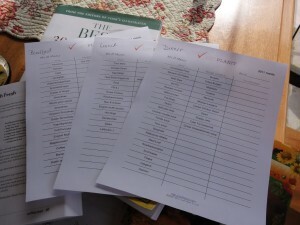 The past year I have been getting back into many routines (like planning a menu)that were shared with my children. Things are changing and all the chores are coming back to me again. I was planning my menu until the past month…thanks for the encouragement…this is really helpful to do. When my children were all little, I would have never survived without a plan!! Thank you Akehia. You inspire me to post more cooking with real foods. I am still learning much too.